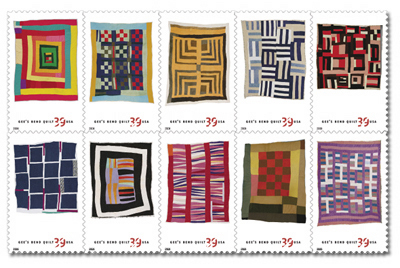 The Mobile Press-Register reports that the three disputed quilts from the collection of Lucinda Pettway Franklin have been returned, only nine days after a lawsuit was filed requesting their return. According to the article, Franklin has been asking for their return for several years. 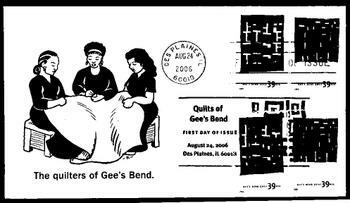 In the press release covered by my last article, the Arnetts sought to discredit Franklin, saying that her false claims devalued the other quilts. Don't take my word for it...check out the Press-Register's latest article on the scandal. I've created a handy PDF for you perusal. I'll try to keep y'all posted on new developments. Is everybody out there tired of my posts about regret? I often regret not being the person I should...I'm kind of like a walking "Cathy" comic strip sometimes. In my quest to better myself, I'll let you all know about my profound regret at missing the train on the "Threadbared" weblog. Of course you know about Threadbared and I didn't. Milk has been squirting out of your nose for about a year now as you read Mary and Kimberly's snarky analysis of vintage sewing patterns. Neither of them can sew (neither can I....more of those Cathy regrets), but that shouldn't keep a person from applying their discerning eye to the craft world. There's also a Threadbared BOOK out there! Order it and study its ways...then you can impress your friends with your own cleverness when you come across a pile of vintage patterns for crocheted dickies. In the meantime, get lost in the Threadbared blog. You'll be a better person for it. In the meantime, I'm off to scrutinize my thighs and have an overcaffeinated office freakout". What have you done for Craft lately? What's that, you say? You made 50 duct tape wallets and 100 lockets containing real locks of Morrissey's nose hair in them for your local craft fair? While you were busy making iPod ponchos, Sweden's We Work in a Fragile Material collective was busy lugging 400 pounds of clay to a cabin in the woods for a frenzied round of artmaking. They were schlepping work to the top of a mountain to fire in a Japanese kiln...heck, they were constructing a gigantic troll in a secret New York City lair. Taken separately, the members of the collective are quirky artists and designers with a yen for craft materials. Together, they're a manic craft force rubbing the public's nose in the thorny issues surrounding creativity, material and market forces. They seek out alternative venues and use their craft to jar the perceptions of the people at those events. One recent exhibition (pictured at left) at a swanky art fair in Stockholm questioned the value of handmade goods, driving their point home by slapping oversized bargain stickers on the objects. You'd do well to keep track of the collective's comings and goings, because they're taking Craft to new places.....like Kylie Minogue videos. Mud always gets slung both ways. Bill Arnett's publicist left a press release as a comment on an unrelated story (the Lustron one, for some reason) on Extreme Craft. I thought I'd share it with anybody who wanted to read the official party line from the Arnetts. In the press release, the Arnetts claim to have had the three disputed quilts form the Mobile article verified by a quilt expert, who claims the quilts are no more than 40-50 years old and worth less than $450 apiece. Hrmmm. If you read the press release, notice that there's no mention of licensing skullduggery. To my everlasting sorrow, I've never written about one of the Godfathers of the DIY craze on this website. I'm talking about none other than Readymade magazine. While you were still saving your lunch money for Anne Geddes prints, Readymade was rolling up its sleeves and getting down to the business of serious tweaking of living spaces. The magazine was a total revelation for me--and one of the first times that it dawned on me that there was a community of like-minded folks out there. I'll never figure out how Readymade manages to be so accessible and intriguing at the same time. Did you know that Readymade has a STORE? It's filled with signature kits that will help you do everything from printing your own shrinky-dinks with an inkjet printer to making your own "meat cart" bed. There are T-Shirts, crazy plexiglass museum tags, and even DIY lettering for use on T-Shirts. 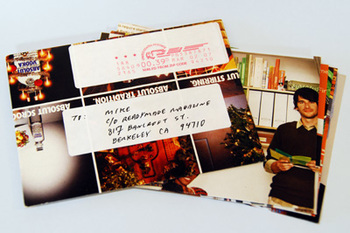 Mike at the Readymade store sent me a packet of their great new notecards (pictured above) that come with recycled envelopes that are each made from a different page of the magazine. Badasssssss. Thanks, Readymade! I mentioned in my last post that I'm a ceramic geek who doesn't write much about ceramics. Some of that comes from being jaded...I've seen so much bad stuff that to catch my attention, something ceramic has to be pretty amazing. 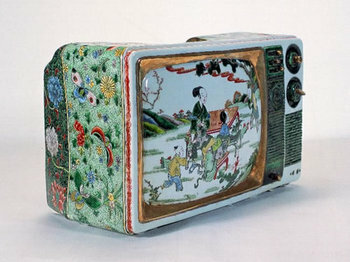 That said, it's taken me a while to warm to the work of Ma Jun, who casts televisions and other hallmarks of modernity, then decorates them using traditional Chinese enameling. The chops that are shown on these pieces elevate them above their somewhat obvious content--it is the sheer obsessiveness and attention to craft that makes them extreme. Ma Jun's porcelain work has captured the imagination of gadget freaks throughout the world by marrying low tech televisions and boom boxes with even lower tech craft. The car pictured to the right stands out to me for its references to the container. Whether molding water bottles, televisions or cars, Ma Jun returns to the realm of function, reminding us that technology and change are hardly new concepts. Also, archaeologically speaking, these artifacts will outlive their plastic and metal counterparts. I can only imagine the wonder of the future archaeologist who uncovers and tries to figure out the meaning of a porcelain television. Clay geeks who frequent Extreme Craft know that I am a fellow traveler. I don't post ceramic art on Extreme Craft very often, mostly because I don't find much extreme ceramic work. I was very excited when Chris Vicini contacted me via MySpace. I hadn't run across his work before, and it instantly grabbed me. 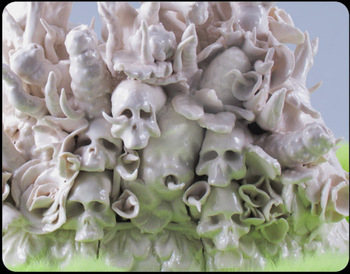 Vicini, who lives and works in Gothenburg, Sweden, loves porcelain figurines, and translates them into his own organic compositions, filled with skulls, flowers....and lime-green fun fur. His work is humorous in a post-apocalyptic kind of way, and combines science fiction with a flair for naturalism and detail. Ever want to know what the porcelain artists at Meissen would have made if they only listened to Norwegian grindcore? Oh New York Times Sunday Style section, why are you so beguiling? I have my Sunday New York Times ritual, which involves reading the front and arts sections in one marathon stretch, then returning to pick the bones of the sports, business, books and travel sections. I usually save the Week in Review and style section for bedtime. So sue me! I enjoy reading about shared summer houses in the Hamptons and a night on the town with a third-tier Baldwin brother. This weekend's style section contained a snarky post-mortem of this year's Renegade Craft Fair. I'd like to crawl inside the mind of a Pomeranian toting upper West Side lady when she finds out about iPod ponchos and carved mustaches on a stick. When I owned a record store in Lincoln, Nebraska, middle-aged housewives were forever coming in my store asking about these "zines" (they always rhymed it with "wines") they read about in the paper. Maybe somebody will start organizing anthropological "field trips" to Williamsburg. Among the many mysteries of the hipster life — Do they actually enjoy the taste of Pabst Blue Ribbon? How many graphic designers can the world need? — one of the most persistent is the much-copied (and parodied) aesthetic. From ironic T-shirts and thrift-store dresses to ’80s jewelry and skinny ties, it can sometimes seem as if every young person who eschews investment banking and law school for creative pursuits looks eerily similar. Where do these trends come from? Who decided, for example, that a small star would be the must-have tattoo, or that the sparrow would become an icon? Who knew that the octopus would replace the sparrow as the DIY icon this year? Hats off to Melena Ryzik and the New York Times for having fun with the Indie Craft movement rather than getting ponderous (or pedantic). Are you effin' kidding me? Anybody who reads Extreme Craft on a regular basis knows that I'm your go-to guy for salty craft commentary. I just had a sobering experience when I typed my URL into Mingle's "What's my Blog Rated" feature. My "G" rating was truly a shock. Want to know how you rate? Just go to the site and enter your own URL. Note to self. Step up the filth. They did notice that I wrote about guns, though....but bad language is obviously much more harmful to young people. Several years back, I was wowed by documentary on Lustron modular homes at the (late, lamented) Dahlonega film festival in North Georgia. Modular homes are very chic right now, with any architecture student worth their salt rising to the challenge of affordable green housing. Lustron came about in the years immediately following World War II as a form of cheap, durable, easily constructed housing for GIs returning from the war to raise their families. The government provided $12.5 million in seed money to inventor and entrepreneur Carl Strandlund, who partnered with architects to create a house that was cheap and easy to assemble. 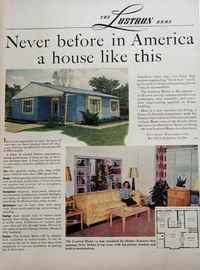 Their answer was the Lustron, a compact home made almost entirely out of enameled steel. The houses offered innovative solutions to heating and cooling, as well as having the advantage of being easy to clean--when the exterior (or interior!) got dirty, it could simply be hosed off. For reasons as complicated as the demise of the electric car, Lustron Homes were forced into bankruptcy by 1950. Imagine my delight when I started chatting with Atlanta area author and vintage jewelry mogul Jeanee Ledoux. It seems Ledoux and her husband live in one of the two Lustron homes in the vicinity. One of the biggest challenges of owning a Lustron home is finding replacement parts for them. Ledoux has fortunately been able to forage for salvaged parts to keep her home (pictured at left) in working order. What happens when rust spots appear, you might ask? Roll up your sleeves, get out the bondo (and your high school autobody chops) and make your house as good as new. May I suggest some kandy-kolored metal flake paint and a racing stripe?